When I get review copies of books, I tend to sit down and read them. Well, not all of them - most often, I am familiar enough with the subject matter that I feel comfortable enough just by reading parts and skimming over the rest to establish whether the book in question covers its subject matter clearly, logically, and in a style that potential readers will enjoy the book and take value from it. My mastery of C# is not that great. It's an area I'm constantly trying to improve. CLR via C# contains so many useful nuggets of information that I forgot I was supposed to be reviewing the book, and have been constantly referring to it over the last few months. I shall continue to refer to this book until the next version of C# is released, and an updated book is published. Then I'll get that. And wear it out. 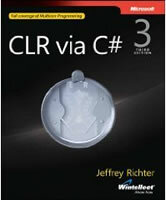 CLR via C# is invaluable to anyone who really wants to understand the language and to get the best out of the .NET Common Language Runtime, but as many previous reviewers have pointed out, this is not a book for beginners. To get the best out of this book, you need to have a core understanding of Object Oriented C# - not just a basic understanding of the syntax. The key thrust of the book is a very deep dive into understanding the CLR. It just happens to use C# to illustrate the concepts under examination. The book is extremely comprehensive. The first part covers CLR Basics, including how the CLR works, and all about Assemblies. The second part looks at Types within the CLR - what they are, how to design them effectively before discussing the Types you are most likely to work with in Part 3. Part 4 covers Exceptions, Garbage Collection, CLR and AppDomains, Reflection and runtime Serialization. The final part is "devoted" (that's probably the best word) to Threading. This particular edition - the Third Edition - has been updated from previous editions to include all that's new in C# 4.0, such as optional and named arguments, and the new dynamic keyword. The foreword, purportedly contributed by Richter's long suffering wife, asserts that this book is a labour of love. The passion that Richter has for his subject is obvious throughout the book, and it is without doubt and extremely valuable addition to any serious .NET programmer's book shelf.